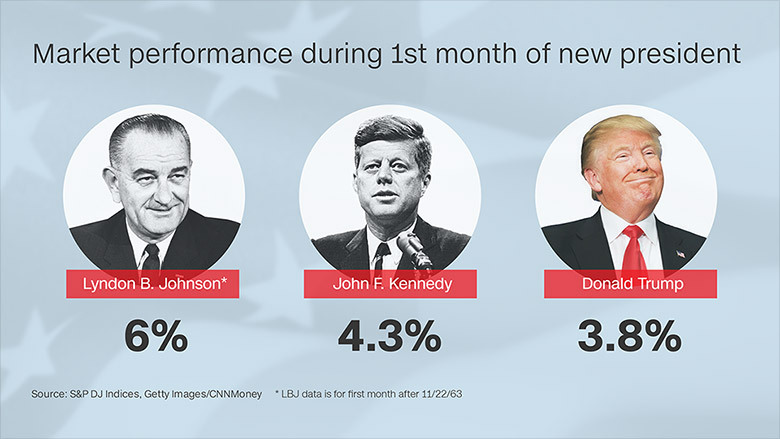 The stock market is having its best performance in the first month of a rookie president's term since the 1960s. The S&P 500 has gone up 3.8% since Trump took office. That's the biggest increase for a new Republican president since the blue chip index that eventually became the S&P 500 debuted in 1923, according to S&P DJ Indices. But Donald Trump is, to quote the late Lloyd Bentsen, no Jack Kennedy. Turns out he's no LBJ either. The market enjoyed a slightly bigger rally -- 4.3% -- in early 1961 after JFK became president. And the market actually had its biggest rally ever for a new president after Lyndon Johnson took the oath in 1963 following JFK's assassination. But even though Trump, a fan of superlatives, can't take credit for the best post-inauguration rally ever, it's clear that Wall Street continues to be optimistic about how the economy and market will fare under his watch. Wall Street is ignoring the infighting in the White House and concerns about Trump's proposed immigration policies and is focusing on the potential for tax reform and a massive infrastructure stimulus plan from Trump and Republicans in Congress. And CNNMoney's Fear & Greed Index, which looks at seven measures of market sentiment, has moved into Extreme Greed territory this week. 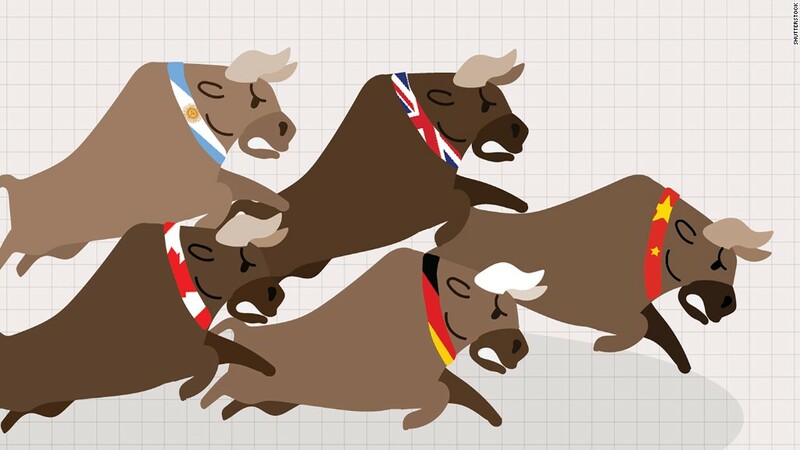 That's another sign of just how bullish investors are. Trump noted the market's resilience Thursday morning. He took a break from attacking the media and leakers in his administration to tweet that stocks are on their best winning streak in decades. To give credit where credit is due, the market is red hot right now. And Trump deserves some, albeit not all, of the credit for that. Hopes for lower taxes are high. It's even a reason why big tech stocks, many of whom have feuded with the president about immigration, are soaring. Investors are hopeful that companies like Apple, Microsoft, Google owner Alphabet and Cisco will be able to take the gobs of cash they have sitting in overseas bank accounts and bring it back to the U.S. at a one-time lower tax rate. These companies could then presumably use the money to hire more workers, open more plants, acquire companies, boost share buybacks and increase their dividends. But you could argue that the market's rally also is due to Fed chair Janet Yellen expressing confidence in the U.S. economy -- and credit for the economic rebound during the past few years probably should go to President Obama, not Trump. The Fed raised rates in December and has given hints that it will hike rates a few more times this year. While the market usually does not like higher rates, Yellen has signaled she is not likely to raise them too dramatically. Plus, rates are still going to be relatively low. They probably will end the year around 1.25% to 1.5% based on current Fed projections. Related: Stocks hit record again. But is Trump really the reason? Or Janet Yellen? So instead of rate hikes being feared as something that could kill the economy and rally, Wall Street seems to recognize that rates are merely returning to more normal levels now that the 2008 crisis is finally in the rear view mirror. But this is not to take away anything from President Trump. It's clear that investors are more confident. But Trump may want to hold off on taking a victory lap just yet. For one, consumer and corporate bullishness often peaks just before a downturn. That was the case in 1999 and 2007. I'm not saying that must happen again. But we shouldn't ignore those events either. Also, did I mention that we're just talking about the market's performance for one month? Presidents aren't judged by historians or investors on their first few weeks. Related: Red-hot Nasdaq continues its winning streak. So much for Trump being bad for tech? To that end, the stock market plunged nearly 6% shortly after Trump hero Ronald Reagan was elected. But after a rocky start, stocks went on a tear that lasted from 1982 until the dot-com crash in 2000. Stocks also plummeted more than 9% in 2009. Obama took office at the height of the financial crisis, but the market bottomed out that March. The Trump bump could be viewed as an extension of the Obama rally, not the start of a new Wall Street resurgence. Finally, it's worth noting that the S&P 500 rose more than 3% in early 1989, the first few weeks of George H.W. Bush's presidency. In fact, Trump and Bush 41 are the only Republicans to enjoy a first month rally since 1928. The market fell during the first month of the Truman, Eisenhower, Nixon and George W. Bush administrations. But the rally for Bush, Sr. didn't last long. The economy cooled soon after he took office -- and Bush lost to Bill Clinton in 1992. Trump clearly doesn't want that history to repeat itself.